Last week while in San Diego for Comic-Con, I was fortunate enough to see Attack the Block followed by a Q & A with writer/director Joe Cornish, producer Edgar Wright, and star John Boyega. I couldn’t have asked for a better start to my geeky weekend. The film opens with our protagonists, a group of young street thugs lead by Moses (John Boyega), assaulting and robbing a woman on her way to her car after a night out. During the hold-up, a meteor falls from the sky and lands nearby. The boys investigate and discover that the meteor housed a dog-like alien creature. After the creature attacks Moses and runs off, it’s chased by the boys, who eventually corner it, beat it to death, and parade around the block showing off their kill before stashing their trophy in a local drug dealer's apartment. Before long, dozens more meteors come crashing to earth filled with creatures seemingly seeking revenge for their recently-murdered little friend. The way the movie unfolds is an absolute joy, and maybe the most fun I’ve had all year at the movies. ATB owes much to horror/sci-fi films from the '80s; throughout it, we’re reminded of movies from E.T. to John Carpenter’s The Thing. While the influence of these (and other) films is felt throughout the movie, Attack the Block still manages to feel completely contemporary and never becomes too impressed with its own genre nods. Like producer Edgar Wright’s brilliant Shaun of the Dead, Attack the Block flawlessly mixes laugh-out-loud comedy with genuine horror. It’s not an easy task to push and pull the audience in these different directions without frustrating or losing the viewers along the way, but ATB never does -- Joe Cornish knows how to tell a story, what buttons to push, and, most importantly, when to push them. One example in a long list of smart decisions by Cornish and Wright is the creature design: it’s SIMPLE. Big, black, hairy creatures with teeth that glow neon blue. They’re hard to see (except for the teeth) and they move like giant wolves. It seems when filmmakers try too hard to make their monsters stick out, we’re left with forgettable, ugly designs. ATB relies instead on movement and a brilliant sound design to help paint the aliens as a major threat. The score by Steven Price probably won’t be mentioned enough in reviews of the movie, but it's one of the strongest aspects of the film. It does exactly what you want it to: enhances each scene, and draws attention to itself without ever becoming a distraction. Not to be forgotten is the film's star, John Boyega. In his first role of any kind, Boyega shines as Moses. What's most impressive about his performance (credit also going to the writing) is that he manages to portray Moses as both tough and smart, while never letting us forget that this is just a kid. For a movie about a group of kids fighting aliens in their neighborhood, it manages to feel authentic. Boyega deserves a lot of credit for that. Attack the Block is my favorite kind of film – one that holds my interest and sticks with me even after a week and a half. When I see a movie like this from a first-time director, it shocks me. Joe Cornish has been around the business for a long time as a writer and actor (it’s not like the movie-making process is foreign to him), but this feels like the work of a veteran. The storytelling is impeccable. From the kinetic pace to the seamless blend of comedy and horror, it excites me that Joe Cornish is now directing movies. 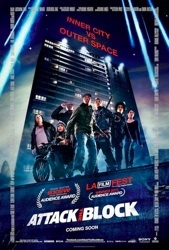 Attack the Block isn’t something we should demand from summer movies. It's what we should demand from all movies.